This was Pvt. 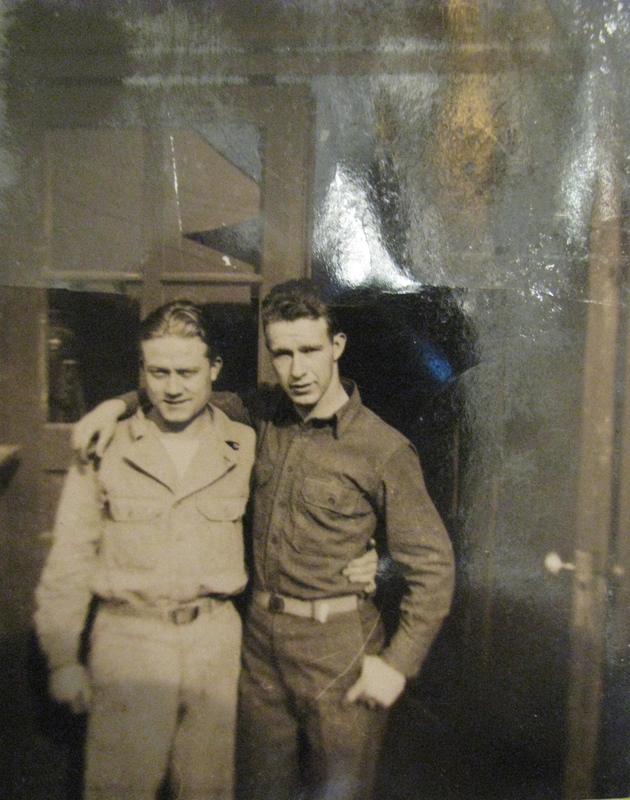 Jiggs Yeager when he was in boot camp at Fort Monmouth, N.J. in 1942. He was 23 at the time. Photo provided. Jiggs Yeager was a sergeant in the 39th Signal Battalion attached to the 26th Yankee Division, part of Gen. George Patton’s 3rd Army in Europe during World War II. The 94-year-old Port Charlotte. 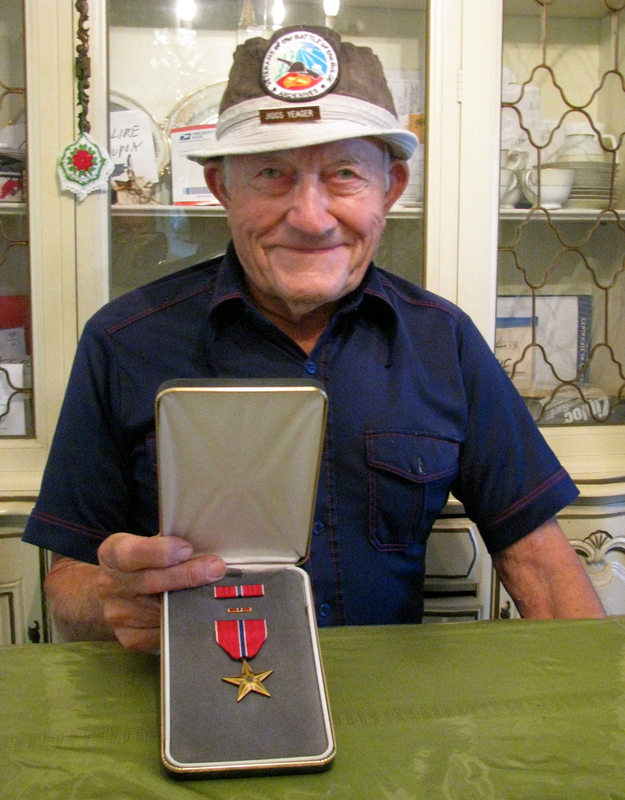 Fla. resident fought in four major conflicts during the war: Northern France, Rhineland, Central Europe and the Ardennes. What he recalls most about his military service was meeting Gen. Patton on the battlefield just before the Battle of the Bulge and the part he played in the biggest battle on the Western Front during the war. “I was with a group of guys stringing communications wire. I was the sergeant in charge when he came up and said, ‘Sergeant, let me use that phone.’ I handed it to him and it was dead as a door nail. Yeager fixed the break in the line and didn’t lose his stripes. The young soldier never forgot his 3rd Army commander. “He was wearing two ivory handled revolvers on his hips. He was dressed in riding britches and shiny brown riding boots. You couldn’t find one dirty spot on him. He was the cleanest general in the Army,” Yeager recalled with a grin. On Nov. 12, 1942 Yeager was drafted. After basic at Fort Monmouth, N.J. he sailed for Europe aboard a liberty ship in convoy with a group of other troop transports. There telephone lines were mostly strung out on the ground and ran for miles and miles. They were subject to being cut by troops and military vehicles that rolled over them. It was Sgt. Yeager’s, and the troops that worked for him, responsibility to keep the phone lines working. He and Patton and the 3rd Army arrived at the “Battle of the Bulge,” shortly after the first day when the German offensive was pressing Allied forces at a weak spot in the line. “Just when I got off the Army truck I was riding in at the Bulge the Germans starting firing 88s (cannon rounds) at us. Shrapnel was hitting all around me and I crawled under our truck. That didn’t protect me much, so I tried to crawl into a ditch but the water in the ditch had turned to solid ice so that didn’t protect me either,” he recalled 70 years later. “So all I could do is watch the 88s coming in on us. They were getting closer and closer as they hit the snow bam, bam, bam. I got one little nip on the ankle from one of them. “Because the weather was -20 below we couldn’t dig foxholes. The ground was frozen so bad. You hid behind anything you could find to protect yourself,” Yeager said. “One night we were all sitting around and all of a sudden I heard this noise back behind a nearby hedgerow. I walked back there and found a couple of Germans with a machine-gun. Our guys heard the commotion they were making. They surrounded them and took out the German machine-gunners,” Yeager said. He and his unit were about a mile behind the front line providing the communications for the commanders. One of his biggest problems was frost bite from frozen feet. “Most of our guys got frozen feet. I was smart because I took the socks and boots from dead Germans and wore them,” he explained. “Because I used their socks I didn’t get frozen feet like the rest of the guys. It was bad at the Bulge. A lot of our guys lost their feet when they froze. Patton was in a hurry to move his army into Germany. This meant Yeager and the men in his battalion were always moving ahead from town-to-town. Further in further into the “Fatherland” the 3rd Army moved rolling back the almost defeated German hordes. By the time Yeager and his battalion reached Linz, Austria it was early May 1945. The Nazis called it quits and Yeager and his buddies celebrated V-E Day in Linz. “The people in Austria were tickled to see us arrive,” he said. “They had had enough of the Nazis by then. “After spending a few weeks slumming in Linz we boarded trucks and were taken by to Le Havre where we spent another couple of weeks living in pup tents waiting for our ship to sail. “We went from there to England. Once in England we were put on little 40 & 8 box cars and taken by rail to Liverpool for our trip back to the States,” he recalled. “We boarded a liberty ship and made the 11 or 12 day trip back to the USA. “Our bunks were stacked five high in the hold of the ship. It was a horrible trip because people were seasick all over. It was the stinkinest ship there ever was. After disembarking they were served a meal of steak and ice cream. “It was a good meal as I recall. It was a treat. It was nice,” he said. Yeager was discharged from the Army on Nov. 12, 1945, three years to the day from when he went in the service. He went back to work at the Union Furniture Co. in Batesville, Ind., where he had worked before the war. He remained in his old job for a few months until he went to work as telephone lineman for the local phone company. He spent 10 years there. “Then Maggie, my wife and I, left Indiana and moved down to Miami where I went to work for Eastern Airlines. I stayed with them for 25 years until we retired to Port Charlotte in 1982,” Yeager said. This story was first published in the Charlotte Sun newspaper, Port Charlotte, Fla. on Monday, Dec. 9, 2013 and is republished with permission. Click here to view Yeager’s file in the Library of Congress. Fabulous photos … Great read.